Offensive techniques include strike, thrust (straight and reverse), inside cut and outside cut. Targets are the head, eyes, temple, ear, nose, neck, wrist, arm, torso, and legs. Unlike other styles, the ssang bong uses two different grips, one standard and the other reverse, to deliver maximum impact. 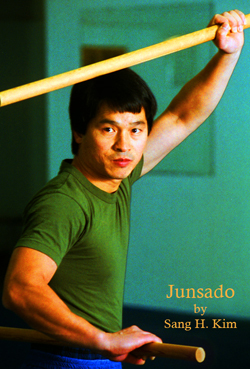 The fundamentals of this unique style include: grip, stance and posture, striking with both the lead and rear stick, primary and secondary defense techniques, blocking and parrying, one flow defense drills, combination defense skills, targets of attack, thrusting and cutting, primary and secondary offense, offensive combinations, combat applications and patterns. 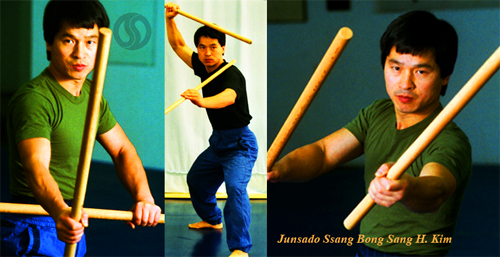 The Ssangbong is a natural progression once you’ve master the short stick (Joongbong). An excellent introduction to the Ssangbong is the Ssang Bong Fundamentals & Patterns video. This entry was posted in Weapon Training and tagged article, double sticks, ssang bong, ssangbong, stick, weapons. Bookmark the permalink.